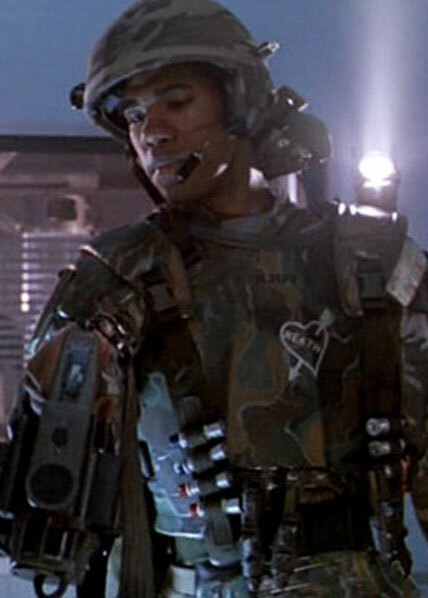 Private Frost was one of the squad of Marines detached to LV-426 to investigate the disappearance of colonists at the Hadley's Hope terraforming colony. Frost will often makes jokes about situations with his squad-mates and generally would try and keep the atmosphere light, even when complaining about obviously messed up situations. When things got serious so did Frost and was respected by all in the squad. In the movie Aliens, Frost was put in charge of holding the ammunition that had to be pulled when moving through the processing station. If during game play Frost is exposed to fire or within the radius of a blast, player may elect to roll one die. On a roll of 1-5 the ammunition store goes off. Treat this explosion the same as a grenade going off in Frosts square.